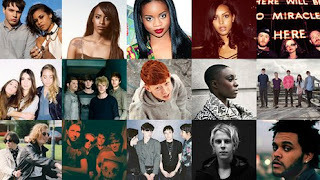 At the end of last week came the double whammy of the announced shortlist and winners of the BBC Sound Of 2013 poll and our UK blogger alternative, the Blog Sound Of 2013. Can one band be defined as the "sound of" a year? Well, apparently so with LA's Haim topping both polls - finding consensus amongst 250 of the most prominent music commentators in the UK. Of course, one band can't really define a year, or a genre, or a region, or anything really aside from themselves. Their main purpose is to make good music. And the idea of "good music" is rarely shared by so many of the pundits and tastemakers that make up these polls. So it's a pleasant surprise that one of my favourite bands of 2012 topped the list. In some respects. Haim rode their early wave of hype at the seaside in Brighton at the 2012 Great Escape festival, blowing away the large contingent of UK music industry folk that witnessed their energetic and charming live performances. Their recorded material has proved similarly enjoyable and well received, with recent B-side 'Send Me Down' perhaps Haim's best track yet. Their incredible melodic fare mixes folk, rock, RnB and even hip hop. Unfortunately, this might be as good as it gets for Haim. Perhaps that's an overly cynical perspective. However, initial success often eludes such hyped bands. Look at Blog Sound Of 2012 winner, Friends, who sank quickly. It's a similar story over on the BBC poll - will Haim go the way of BBC Sound Of 2009, Little Boots, or the way of BBC Sound Of 2008, Adele? We just don't know. Find more info on the BBC Sound Of poll at bbc.co.uk.